*Don't forget to update your favorite & links! Scroll down the page for our email address information. Dave O. is finally back! Responses to your emails may still be a bit slow. Congratulations to Sharon O. & Carolyn from Cyberspokes! the official logo for all Harley Happening merchandise. Pick up your shirts at Gowanda Harley Davidson. Now we really know Harley has great taste! ... and our dedicated staff ??? *NOTE: Please put something motorcycle related in the Subject field when emailing us. The influx of spam & virus emails have forced us to delete all other unidentifiable emails. If you want us to list your event or business, please read our SERVICES page BEFORE you email us! 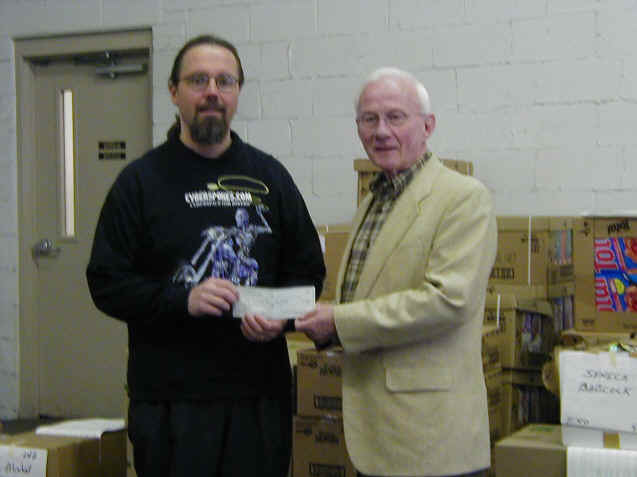 Cyberspokes President "Dave O" presents donations to the Fire Co. and The Food Bank. Through our Buffalo & Western New York Events page, we provide an opportunity for local motorcycle clubs, dealerships, vendors and individual motorcyclists to join together to make a positive contribution to the community and to the motorcycling image. We also sponsor an Annual Run, Chopper Show and Benefit Party for the Food Bank of Western New York on the last Saturday in April. We also want to demonstrate to the public and to all officials that motorcycling is more than a stimulating and invigorating recreation. For many people, riding is a socially responsible form of personal transportation that saves energy, reduces congestion, adds parking spaces, helps the environment and provides a broad range of other public benefits. Today there are over two hundred and twenty million cars and light trucks crowding American roads and seven million registered motorcycles. If more motorcycles become a regular part of the transportation mix, it will help make urban parking easier and traffic will flow better. World wide demand for motorcycles is forecast to advance to 41.9 million units, valued at $40 billion through 2009. Motorcycles get 50.1 mpg on average, while passenger cars get 22.3 mpg, and light trucks and SUV's get only 17.7 mpg. A motorcycle with a 5-gallon tank can go 200-250 miles between fill-ups! BIKERS HELP SAVE THE WORLD !! 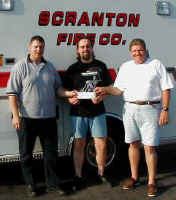 We are also members and big supporters of ABATE - American Bikers Aimed Towards Education. If you are not a member, you should join NOW. Our mission is to become the world's finest "Virtual Motorcycle Club" and web site catering to motorcycle enthusiasts. Our club t-shirts and helmet stickers have been voted "Best Biker Design 2000"! We also pride ourselves on being a Motorcycle Directory with a "personal touch". 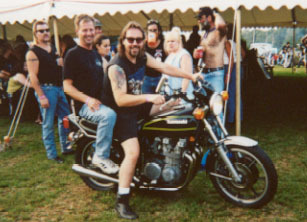 Whether your a BIKER who likes to "Ride the Net" or a Computer Nut who likes bikes, you'll want to visit Cyberspokes.com daily! In additions to hundreds of motorcycle-related sites and event calendars, Cyberspokes.com also provides access to Biker chat rooms, free classifieds, tech tips and discussions groups. We can also show you how to find sites specializing in Tattoos, Blues, Rock & Roll, and more biker favorites. Because we realize that not everyone can afford (or wants) a high-speed Internet connection, we designed our site to be a bare-bones no-frills resource. Unlike many other sites which make you wait 10-minutes while you download useless graphics or flash images, we make it as easy as possible for you to get to the information you need, quickly and efficiently. Find information about Cyberspokes Club Meetings on our Clubhouse page. Looking for something for you or your Bike? Whatever it is... this site will help you discover where to find it. Please note: We HIGHLY encourage you to patronize your LOCAL BUSINESSES FIRST. Then, if they can't help you... "Ride the Net". Cyberspokes.com is now recognized as one of the BEST motorcycle-related directories on the Internet! In addition to hundreds of other partners, we have the support of: Harley Davidson, Easyriders, Biker Billy "Cooks with Fire! ", The Cabbage Patch, American IronHorse Motorcycle Company, The Horse - Backstreet Choppers Magazine, BabeOnHD.com, Biker Heaven, The Hog Farm, ABATE, J & P Cycles, Cycle Trader, The STURGIS Buffalo Chip, Biker Source, HDbid.com, HawgIT.com, Genuine Cycle, HarleyShirts.com, MotoDirectory, BadPig Products, BikeLinks4You.com, Performance Coatings, ShinyBike, and many many many more! Try clicking on any of these sites to see our listings. So if you own a biker-related business, or you are organizing a biker event, you will definitely want to take advantage or our FREE SERVICES program. On April 3rd 2005, we had 18 inches of snow in Hamburg, NY. A week later, it was 65 degrees and sunny. What makes Cyberspokes different from the others? 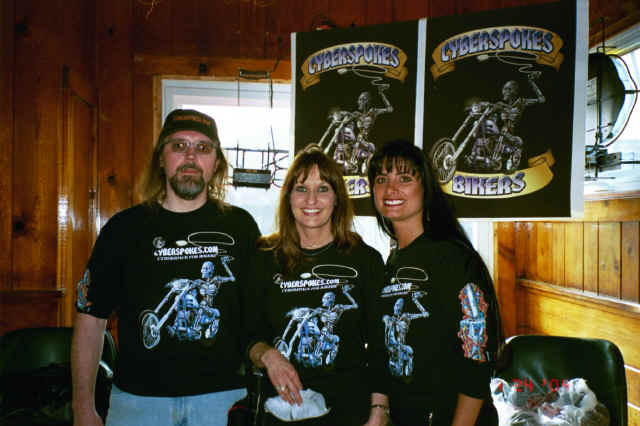 Cyberspokes originally started out in 1999 when David J. Owczarczyk "Dave O" was looking for a way to combine his love of motorcycles with helping out those less fortunate in the community. But, as both the Internet and the motorcycle industry were getting very popular, we started to notice that several things were happening. There were plenty of Motorcycle-related web sites being created everyday but most of them were either too large and impersonal, or too small and basic. Many of the Motorcycle Directory sites automatically added any link or event which was submitted, without even checking to see what they were! Most of the Motorcycle Club or Personal Sites just contained a lot of boobie-shots and four-letter words. Our goal is to create a site which combines the "personal touch" of a Virtual Motorcycle Club (VMC) with the information-rich features of a Motorcycle Directory. We also noticed that it can be VERY DIFFICULT and EXPENSIVE for most biker-related businesses and charities to list themselves or their events on the World Wide Web. You should be able to dedicate your money and efforts on RUNNING YOUR BUSINESS or CHARITY, not on worrying about computers. Unless you want to of course. That's why we offer our FREE SERVICES program. It all started back in June of 1965 when Chester & Adeline Owczarczyk of Lackawanna, New York gave birth to a "bouncing baby biker". Tipping the scales at almost 10 pounds, it was pretty obvious that chubby little Davie was not going to be a successful ballerina. "Dave O" used to love when his big brother Chet's friend Eddie would roar into the driveway on his Harley to visit, or when the local Lackawanna Motorcop would let him sit on his department-issued Panhead. This influence led to hours of enjoyment playing with his favorite toy, the Evel Knievel Stunt Motorcycle set. Also, Mom & Dad O found themselves buying "Dave O" a new Big Wheel (and pair of Tough-Skins) just about every 6 months or so, because his radical driving would shred the plastic front tires to bits. Or was it the fact that most 8 year-olds shouldn't weigh 170 pounds? Tough-Skins were supposed to have reinforced knees but Davie was a hefty fella, so by the time his mom tailored them for his girth, they were actually Tough-Ankles. He then graduated to jumping ramps with his Huffy Thunder-Road and other assorted banana-bicycles. Although "Dave O's" mom wouldn't let him own his own motorized 2-wheeler, he took advantage of every chance he could get to ride his buddy Vince's mini-bike and his friend Kenny's dirt bike. One day he side swiped a moving car on the mini-bike, and then the next day he witnessed one of his ramp-jumping buddies break an arm. But hey, that only added to the mystique! As a teen-ager "Dave O" was your typical beer-drinking, rock & roll'n, piss pot but he always kept his head on straight and tried to keep run-ins with the authorities down to a minimum. Although he enjoyed his share of inexpensive, fixer-up cars and four-by-fours, there was still no cash (or Mom's permission) for a Harley in his driveway. Fast-forward 20 years later, "Dave O" was now settled down enough (with his marriage, job, mortgage, car payments, and college degree in computer science) to afford a used Harley Davidson Sporty. "Dave O" and his wife Sharon's first long trip was a 700+ mile round-trip to Vermont. On an 883 with a stock seat, this could best be described as "hemorrhoids on a jack-hammer". But that didn't scare them. After all they've been married for over 13 years! Sometimes they rode, sometimes they trailered, and sometimes they flew... but one thing was for damn sure: Daytona, Sturgis, Laconia, Myrtle Beach, and more were now a reality. 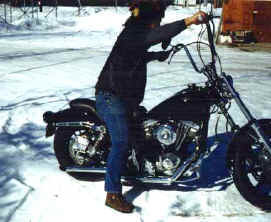 "Dave O" sold the Sporty six years later, and he is now driving the "Cyberspokes Custom Panhead Chopper" with a S&S 96 c.i. stroker power-plant. 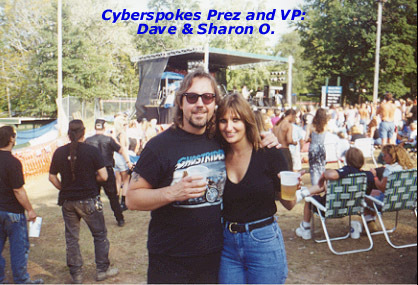 Although "Dave O" does most of the web stuff for Cyberspokes, Sharon is the reluctant talent behind all of the marketing literature, trade show literature, accounting, inventory management and much much more. Sharon rides too, on her 1979 Kawasaki KZ-600. Hey, no jap-bike jokes, give them a few grand and they'll trade it in!